Three universal microphone / monaural line level input channels. One monaural balanced line level input. LED audio output level VU meter. Three 1/4″ stereo headphone outputs with independent volume, IFB pan and program pan controls for custom headphone mixes. Line level monaural monitor speaker audio output with switch configurable microphone muting. On-air tally/warning light relay output. Remote channel control and status via terminal block connectors. 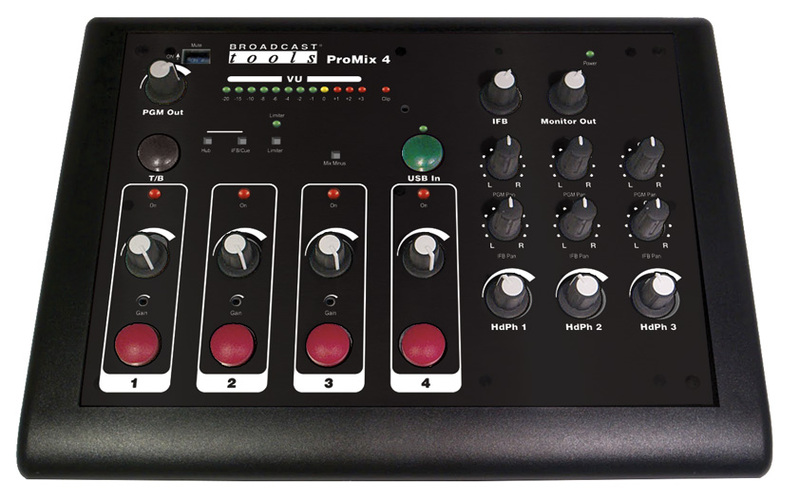 Can be combined with additional ProMix 4 and/or ProMix 1 units with the ProMix Hub 6 and standard Cat5 cables. Can drive multiple AHR-1 Plus headphone system.